There was a time when Town & Country Planning Association and the Royal Town Planning Institute were serious, professional organisations. Apparently they are no longer, as their leaders have succumbed to the mindless obsession with climate, that seems to have rotted the brains of our ruling class. I earned a penny yesterday. Today I earned tuppence. Perhaps someone might tell me how soon I will become a millionaire, if my earnings continue to increase at the same rate! For supposed experts to rehash this drivel is frightening. If they had bothered checking with BP, they would have found that in the UK , solar power provided a “remarkable” 1.2% of primary energy consumption in 2016. Pitiful, I would agree (though it probably has something to do with the fact that solar power provides next to nothing in winter. But if they had carried on checking, they would also have discovered that worldwide solar power is only supplying 0.6% of total energy. How can two professional bodies, who we all rely on for competence and integrity, have been so utterly brainwashed by the renewable lobby? There is absolutely no evidence that there either has been or will be a dramatic increase in severe weather incidents – from heat waves to flooding and major changes in rainfall that will have a major impact on water supply. Aware that people refuse to be alarmed by a slightly warmer climate, they resort to about the only scare tactic they have left – floods. 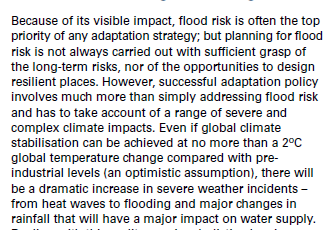 They talk about “climate resilience”, but perhaps they might care to explain why they have allowed thousands of houses to be built on flood plains in recent years. 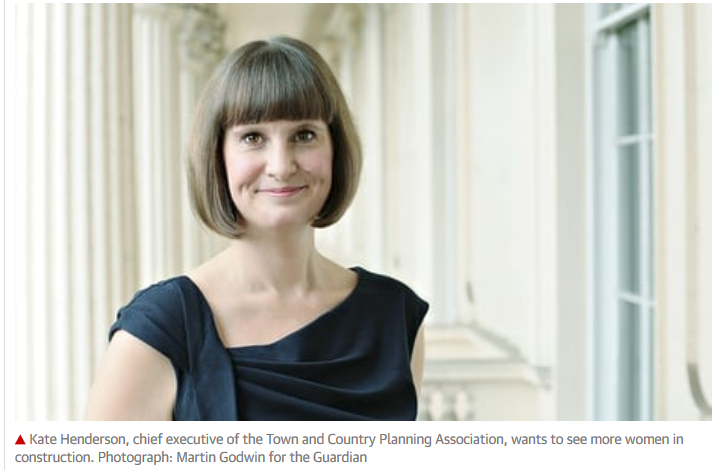 As the Guardian also reported in 2014, she is the TCPA’s first chief executive without a background in planning. 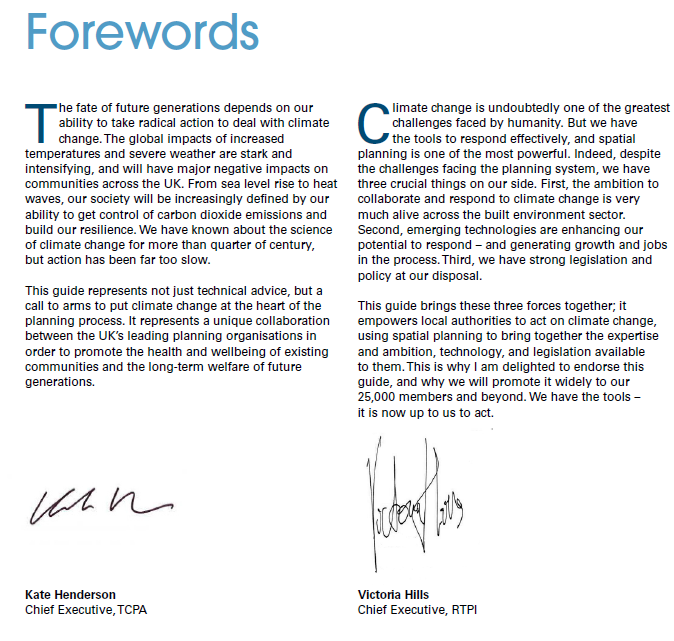 Kate Henderson is Chief Executive of the TCPA where she leads the Association’s efforts to shape and advocate planning policies that put social justice and the environment at the heart of the debate. Kate has raised the TCPA’s profile through a range of high profile campaigns, research projects and policy initiatives, most notably around garden cities, affordable housing, poverty and climate change. She has been involved in a number of government panels and independent commissions including the independent Lyons Housing Review. Hills has only been in post since January, so can have played little part in the writing of the report. As we have seen with other professional bodies, policy making has been taken over by a tiny clique at the apex of the organisation, who all have their own personal political agenda. Consistently we find that they are also extremely well networked with other likeminded policy makers across government and other influential organisations. It is little coincidence that Henderson has been involved in a number of government panels and “independent” commissions. This is exactly how the green blob works. My guess is that the vast majority of the RTPI’s members, nearly all of them qualified planning professionals, will be horrified that their organisation has been taken over in this way. 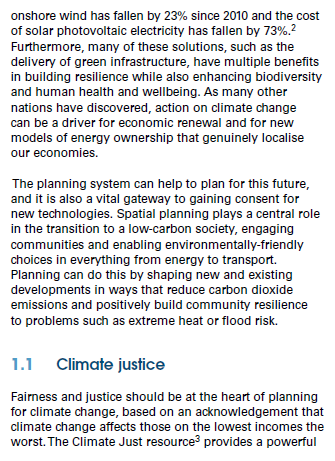 In opposing hundreds of renewable energy applications I have come across dozens of “planners”, from LPA planning officers to planning inspectors. I can confirm that the new planners are far more “green” than their predecessors, although every single one has to toe the “green” line. Paul, I read your posts with interest and trying to tell Fact from Fiction is very difficult in the Climate Change arena. Thank you for the clarifications you provide. Please, feel free to circulate further. Some great points summarised, thanks for this. There are all sorts of problems with dealing with domestic property and older retail properties as far as AGW/CC is concerned because of the UK’s Listings for heritage and English Heritage itself together with their Welsh, Scottish and Irish equivalents. Add in the Victorian Society and the problems are multiplied, especially when public buildings, churches for example, and other architecturally significant buildings are included. If there is wholesale legislation from central Government to scrap all those limitations then we can cover all buildings, old as well as new, with Solar Panels and Wind Turbines. Then the power utilities will probably go bust because their profits will be wiped out. No one will want to work for them for sixpence. The built environment will look absolutely awful and probably not sound too good, either. Mass suicides might be likely, if not because of aesthetics and noise, then because of massive job losses. Why don’t I live in England, where the Sun shines 24 hours a day. Are you confusing us with Spain where they have managed to produce solar power 24/7? Do they really suspect Ms. Figueres of science? You mean the one who is a member of the Costa Rica National Liberation Party? The one who admitted that the Paris Climate Accord was not about climate, but changing the world from capitalism to Marxism? That one? Of course, she is very wealthy and married wealth. 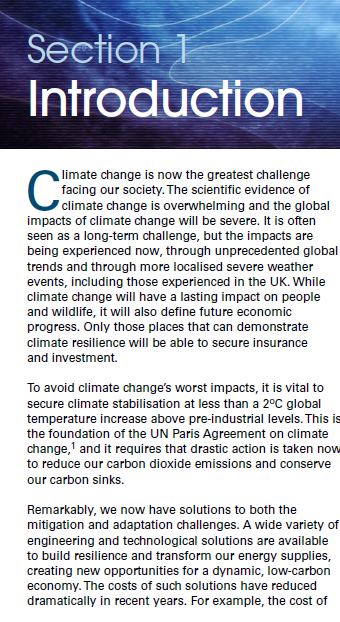 It was remarkable in reading through this “Guide” that there was no mention (not even one) of the emerging Capture-and-Store technology that is part of the plan to keep and lower atmospheric CO2….the strong views of James Hansen, GISS, and other activist controlled climate alarm locations such as McKibben’s 350.org. 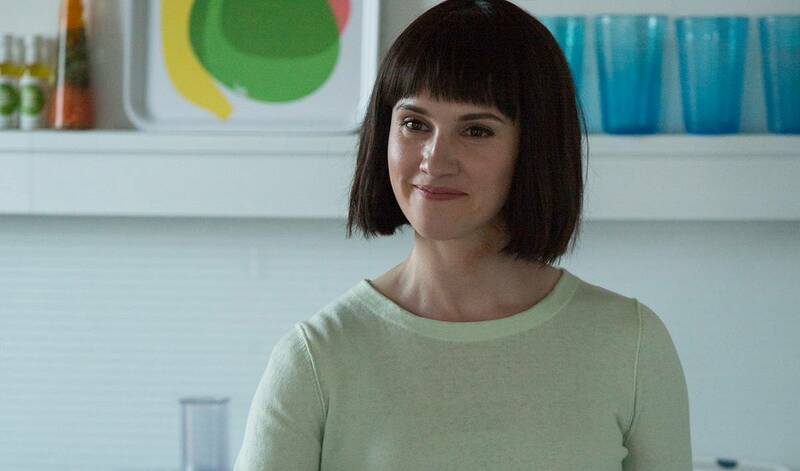 Maybe Kate and Victoria realize that it not only risky but impossible to “pull off”? 27 days, assuming 100 pence to the pound and a doubling every day. The concept of compounded interest passed them by. Of course to them the pie never gets larger. If you have a piece, you took someone else’s piece. Rank hypocracy again. 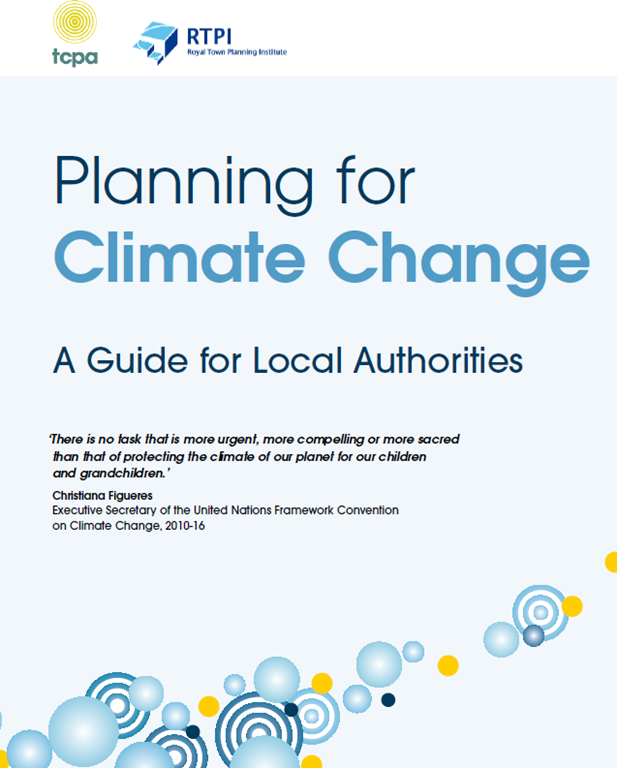 Its our Planners who mandate more car use and maximum CO2 and carbon emissions (not that they’re a bad thing). They zone ‘housing estate’ ghettos from which you must drive to a ‘Business park’ ghetto or ‘science park ‘ghetto’ then to a ‘shopping precinct and entertainment zone, then back to the housing ghetto estate. They segregate all normal daily activity and force us into cars. (Its the USA model). Why not the historic european model where you live above your workshop and the shops are interspersed with housing. Apartment blocks with workshops and offices and shops and housing? Most business parks have wide pavements and tended garden,; fabulous places to live and for children to play. but after 6pm and at weekends they are deadzones as the planners have banned accomodation from the nicest and most convenient places to live. Only dirty, noisy and dangerous activities (less than 2% of modern business) need segregation. Most business can be integrated with residential. Our planning system is moronic and addicted to necessitating maximum car use. Their policies mandate maximum exhausts. There is an upside to empty business parks at weekends – you can race motorcycles round them. The Dutch and Germans hold race meetings there. In the UK they make great places for boy racers and bikers. Ask them to define ‘climate change.’ Watch them stammer. At one time I thought about being a city planner. Two minutes, 2 beers and a good night’s sleep cured me. After 40 years of watching this global mind set develop, I cannot yet understand how the obvious transparent stupidity of it all, plus the lack of hard supporting science, has been overcome and set firm in the aspirational lists of such people. They would have to be silly enough to pay 100 pounds for a small bottle of mud to smear nightly on the face for an aspiration to greater beauty. One day I shall have a deeper think about the part played by the advertising industry. My invalid preconception is that advertising creators have no interest in whether the product works or not, so long as they make a quid out of pushing it. I suspect their force fields are stronger than many realists realise. Geoff. They are both WOMEN. Silly fluffy things. I avoid most women’s groups although much of my time is spent doing the work of The Daughters of the American Revolution. However, we have more important things than being fluffy bunnies and the very nature of the group implies we are made of tough stuff. BTW, I am an associate member of the Walter Hines Page Chapter National Society Daughters of the American Revolution in London. When I arrived in the early morning of June 13, 2015 for the 800th Anniversary of the sealing of Magna Carta, I managed to make their annual meeting at All Hallows-by-the-Tower Church. Yes, I also descend from several of those barons and I take all of this seriously as my duty to live up to what my Magna Carta and Revolutionary patriots did for me and others. I can’t say I was surprised to see this given the policy of inequality that sees women given top jobs just because they are female. At one local authority we had a manager who was female and ethnic as well. They were overjoyed at ticking two boxes. What this policy along, with Blue Labour’s demand for more women on boards, is undermine the talented women out there. I note that having got shot of one leftie female, the National Trust has saddled itself with another. With costs dropping by 25% every 2 years, 10% annually? If I were in charge of investing money in so called renewable green energy I’d wait until the costs had become equal to a couple of cans of high sugar fizzy drink before I even thought about spending money. I the mean time I’d spend a bit of cash mending potholes and ensuring that flood defences were maintained for when the inevitable very wet spell arrived in my area. Ladies Hill and Henderson are most probably Common Purpose graduates who learn to influence authorities and businesses outside their normal boundaries. As for planning, it does not seem to stop identikit housing being built all over the country, crammed into the available space with pokey little rooms, no storage space, insufficient off-road parking space and far too narrow access roads. And none of them get a potentially active chimney – because we are all going to die from the fumes given off by wood burners!! And, while the government appears powerless to stop mass immigration, there’ll never be enough houses. And as with so much of bureaucracy and governmentt these days, it doesn’t overlap with the other 90% of the population. Just threw up on this virtue signalling absolute rubbish. Henderson also needs a good dose of Professor Jordan Peterson to understand first principals about the nonsense of women in jobs they obviously don’t want to do! Witness the mention of “affordable” housing and “climate justice”, what really gives them a swelling sensation in the underpants is Social Engineering. They are part of the reason why the UK has, for years, built nothing like enough new houses even for British people (never mind migrants), why house prices are indeed unaffordable and why so much of the housing actually constructed pays scant attention to purchasers needs, let alone their aspirations. Good points. The evidence is that older people – or like me looking ahead when buying my house – would prefer a bungalow. Do they build any? No. In fact over time I have seen many existing bungalows demolished and replaced by 4/5 bedroom houses. So many people who would downsize and free up a family sized property stay put because of the lack of suitable properties and of course being stung for stamp duty if they do move. Nice point nigel. made me laugh. Agenda 21 & 2030 in action. It is in every walk of public life now and taught in schools. Call me cynical, but my immediate reaction to that statement is that it comprehensively excuses, in advance, any and all failure to competently fulfill the tasks conventionally understood to be the responsibility of government. Reminds me of when I was a kid (age in single digits) and tried to get away with not doing my homework because it was interrupted by more pressing concerns. .
TCPA NGO is there a difference? Planners are not smart people. They follow every popular delusion that comes along. They are incapable of looking at actual data and forming conclusions. A classic example is the planner’s obsession with eliminating cars and forcing people into transit. But a look at the actual data shows that cars use less energy than transit, are faster, much cheaper (1/4 the cost) and obviously more convenient. Another example is their belief that high density saves money. But the neglect the cost of housing which is dramatically higher in high density. The truth is that almost all of the things that city planners tell us are simply not true. One reason is that they are usually economically illiterate and the foundations of planning is that making places that look good without concern for function. They also fall for the delusion that making American cities look like European cities will automatically make people live like Europeans – less energy use – less driving. A look at the most popular planning books shows pure emotion, not logical thinking. Sadly, most of the population are non-technical and not very cynical about the information presented in the media. On this basis, the populace are being brainwashed by a massive meja pushing of the CC hypothesis. My wife is a good example, she is convinced that I am just rebelling quietly as the nice news-people cannot all be wrong. I can understand that most people expect an honest press: however, I cannot understand how so many numerate people cannot see the massive faults in what is being fed to them. Mr Bookers explanations seem the best available for this group-think problem.